We listened to all the great feedback that you gave after we released PhoneLog and worked hard putting new features into PhoneLog Pro. Full rich text support in the notes field so you can use multiple fonts and styles — just like TextEdit. Drag and drop files and emails into the notes to keep track of things discussed on the call. 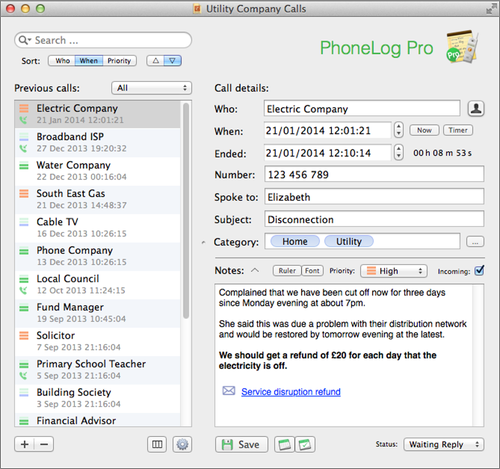 Sync your call logs between multiple Macs, iPhones and iPads that have PhoneLog for iPhone & iPad. A Dropox account may be required for this. (*) Note that most, but not all, features are available for call logs that you sync. Please see the features page for exact details.